If you think your aging alone has to do with your joint pains, you are not completely correct. These connections between your bones called joints that help you move and support you in whatever you do4 may get pain due to various reasons. You may have joint pains due to osteoarthritis, rheumatoid arthritis, gout, bursitis, strains, sprains, simple inflammation or some injuries. While knee pain is the most common one, other joint pains like shoulder and hip pain too affect many people. However, this is not all, you may get joint pain anywhere from your ankles to your shoulders not even sparing your finger joints. What is the exact cause of your joint pain can only be diagnosed by your physician? But there are certain natural remedies that can get you rid of the mild to chronic joint pains. Here are some such home remedies for joint pains. Turmeric is a common spice that is used every day in South Asian cooking, especially in India. Ayurveda as well as Chinese medicine use turmeric for various medical conditions including pains and inflammation. If your joint pain is due to arthritis, turmeric is the herb for you as it contains curcumin which eases pain miraculously. A study conducted by the University of Michigan Health System found out that turmeric works better than nonsteroidal anti-inflammatory drugs to relieve inflammation after surgery. So, if you are suffering from rheumatoid and osteoarthritis, use turmeric to reduce inflammation and stiffness of your joints. When you take turmeric with ginger, you have even more chances to relieve your joint pains because ginger too, like turmeric, contains anti-inflammatory properties. Here is a recipe for a tea made with turmeric and ginger for your joint pain relief. How to Make Turmeric Ginger Tea for Joint Pains? If using fresh turmeric and ginger roots, wash them well, peel and chop them in rough pieces. Add turmeric and ginger to this boiling water and simmer for about 5-10 minutes. Strain and add honey and then sip your yellow herbal tea. If using powders of turmeric and ginger, add them to hot water and steep for 10-15 minutes. You may not need to strain this but if you want, you can strain it. It is better to take turmeric-ginger tea in between your meals because when taken with meals, they work more for digestion rather than for reducing pain in joints. Warning: If you are taking medicines meant for thinning the blood, you should avoid having turmeric as well as ginger or take them under medical supervision. Both these herbs are capable of thinning your blood. If you try to swallow the extra virgin olive oil, you will feel a peppery sensation at the back of your throat. This is due to a component in olive oil called oleocanthal. Researches have shown that oleocanthal is capable of preventing the production of two enzymes that cause inflammation. These two enzymes are COX-1 and COX-2. The nonsteroidal anti-inflammatory drugs (NSAIDs) do the same thing- prevent the production of pro-inflammation enzymes. So, now you know why olive oil can get you rid of joint pains. They do it by inhibiting the pro-inflammatory enzymes and thus dampening the sensation of pain. However, olive oil should have oleocanthal in them. Strong flavored olive oils like extra virgin olive oil and to some extent, virgin olive oil have more amounts of oleocanthal in them. How to Use Olive Oil for Joint Pains? Use extra virgin olive oil for salads, pasta, marinades, sauces or as a dip for your bread. Massage your aching joints with olive oil to let the magic compound directly seep into the joint tissues. Use virgin olive oil for grilling or broiling. Precaution: While 50 ml or 3- ½ tbsp of olive oil may work like a 200 mg ibuprofen tablet, it may also transfer more than 400 calories to your body. So, it’s advisable to replace other fats with olive oil rather than to add it to your daily consumption of other oils and butter. You sure don’t want to gain weight while reducing your joint pains! Flaxseed has been considered one of the super-foods of today by many due to its high contents of omega-3 and omega-6 fatty acids as well as lignans. Lignans are the beneficial plant compounds just like fiber. Flaxseed oil can ease the symptoms of rheumatoid arthritis, lubricate joints and reduce stiffness as well as joint pain. Flaxseed oil is high on alpha-linolenic acid (ALA) that can be converted to EPA and DHA, the same active ingredients that are found in fish oil. ALA is an omega-3 essential fatty acid essential for maintaining the cell structure as well as the functioning of your joints. It has an important role in making anti-inflammatory substances, prostaglandins, in your blood. Not only this, flaxseed oil also has magnesium, potassium, B vitamins, protein and zinc all of which are significant in reducing pain and inflammation. Take 1-3 tbsp of this oil daily. While it will not work instantly but you will feel your joint pains reducing within 1-3 months. It might even vanish, depending upon how your body reacts to this beneficial oil. You need to take this oil regularly as its components maintain the functioning of your joints. Precaution: Flaxseed may lead to stomach discomfort, rashes or breathing difficulties. If you are taking blood thinners or cholesterol-lowering medicines, consult with your doctor before you start consuming flaxseed oil. Flaxseeds may act as a blood thinner. Avoid having it if you have hormone-sensitive breast or uterine cancer. 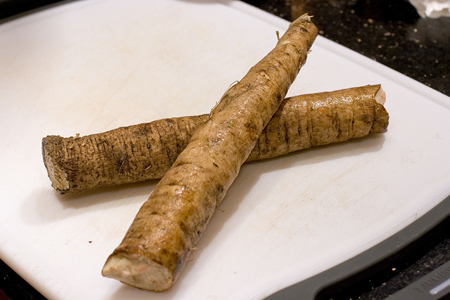 Burdock Root, sometimes called ‘poor man’s potatoes’, is eaten as a vegetable in Japan and Japanese call it ‘Gobo’. Burdock Root has been traditionally used as medicine in Europe, India and China for joint pain as also for respiratory disorders, abscesses, urinary problems and for detoxification and cleansing. Burdock has essential fatty oils with sterols and tannins that are anti-inflammatory in nature. While you can always have burdock root as a vegetable, here is a recipe for tea that you can have to relieve your joint pains. How to Make Burdock Root Tea for Joint Pains? Add burdock root to the boiling water. Strain and drink warm burdock tea. You may have 3-4 cups of this tea during the day. Cayenne is extensively used by traditional herbalists for treating muscle and joint pains. Modern researches too have established the ability of cayenne pepper in reducing pain by affecting the nervous system. There is a neurotransmitter in your system called ‘Substance P’ which sends a signal to your brain regarding pain. Now, the substance called capsaicin present in cayenne blocks this ‘Substance P’ and thus your brain doesn’t get any information about pain. As a result, you do not feel the pain. Here is a recipe for making cayenne salve at home. How to Make Cayenne Salve for Joint Pain? Mix olive oil and cayenne powder. Heat it over the double boiler till it is warm. Put off the heat and allow the warm mixture sit for 15-20 minutes. Again heat the mixture until warm and let it sit for another 20 minutes. Repeat this heating and colling down of the mixture for at least 2-3 hours. You may do it for longer too, for the whole day. This will make your infusion stronger. Once you have got your desired strength of cayenne infused olive oil, use the cheesecloth to strain the thing and reserve the infused oil. Now take the beeswax and melt it by heating. Stir in the cayenne infused oil into the beeswax and mix them thoroughly while allowing them to melt together. Pour the mixture into your choice of container. Don’t forget to label the container. Apply this cayenne salve on your joints to get relief from pain. From the previous home remedy for joint pains, you now know why cayenne can be helpful in relieving these pains. Combining cayenne with mustard and ginger can give you even better results. While cayenne blocks the sensation of pain, mustard acts as an irritant and flushes the blood towards your skin surface. This loosens up your stiff joint muscles. Ginger with its anti-inflammatory components, gingerols and zingibain, treats the swelling of your joints and also suppresses that substance which triggers pain and inflammation. Here is the recipe for a warming oil made with these three ingredients to give you relief from your joint pains. How to Make Warming Oil for Joint Pain Relief? Place cayenne pepper, crushed mustard seeds and grated ginger in the glass jar. Pour oil over them. Mix well. Cover the jar with a lid and let it sit for 7 days. With the help of cheesecloth or sieve, strain the herbs infused the oil. Store in a bottle and label it. Apply the oil on your joints and gently massage with this warm oil to get relief from pain and swelling. Our body produces certain chemicals like ‘prostaglandins’ that lead to inflammation. When you consume herbal preparations made with nettle plant’s aerial parts (like leaves), you affect your body’s production of such inflammation-causing chemicals. Nettle’s aerial parts also reduce the sensation of pain by interfering with pain signals sent to your brain. You may thus get relief from both, joint pain as well as inflammation by having nettle leaves tea. How to Make Nettle Leaves Tea for Joint Pains? If using fresh nettle leaves, add them with water and bring to near boiling point. Now simmer for about 10 minutes. If using dried nettle leaves, add the dried leaves to a cup of hot water. Cover and let it steep for 5-10 minutes. Strain, add honey if using and enjoy your nettle herbal tea. As common an ingredient as blackstrap molasses can relieve you of your joint pains! And this is the byproduct of sugar making process, something which is considered a waste. But did you know that blackstrap molasses contains a whole lot of minerals in it- iron, magnesium, calcium, potassium, manganese and lots of other trace minerals! While magnesium and calcium are essential for healthy bones, magnesium also prevents muscle spasms. Potassium in it makes muscles strong. Potassium deficiency is one of the causes of arthritis. All these minerals combined in blackstrap molasses makes this sweet drink one of the best remedies for joint pains. Add 1 tbsp of blackstrap molasses in a glass of water. Have this three times a day. Apple cider vinegar is yet another mineral-rich drink. It contains magnesium, phosphorus, calcium and potassium, all of which are important for your bone and muscle health. A diet rich in minerals is a pre-requisite to avoid joint pains, especially pain from arthritis. Potassium reserve of apple cider vinegar is especially beneficial for joints as it prevents calcium build-up in your joints. This type of build up leads to joint stiffness. Pectin found in apple cider vinegar also helps in flushing out the toxins from your body. Sometimes, joint pains are due to toxins that get accumulated in the connective tissues of joints. Mix one tablespoon of apple cider vinegar in a glass of water. Super Remedy for Joint Pain Relief: Mix 1 tablespoon each of apple cider vinegar and blackstrap molasses in a glass of water and have it three times a day! It will taste delicious too. Add apple cider vinegar to the hot water. Hot water should be at a temperature that your skin can tolerate yet not warm or too little hot. Soak a cloth or a towel in this water. Wring lightly to discard excessive water. Do not make the towel dry, just drain out the excessive water. Place this cloth on your aching joint. Keep it warm by covering with a plastic or an oilcloth. Wheatgerm is the edible part of wheat kernel which is removed during processing of wheat and is still valued for its rich nutritional profile. It is a powerhouse of nutrition having 23 nutrients including potassium, iron, riboflavin, calcium, zinc, magnesium, Vitamins A, E, B1 and B3. Protein content in wheatgerm is even higher than that found in most of the meat products. Oil prepared from such nutritious wheatgerm can make your entire body healthy and not only your bones, muscles, tissues and joints. A research conducted by the University of Maryland Medical Center states that omega-6 and omega-3 fatty acids in wheat germ can help people suffering from rheumatoid arthritis by reducing pain as these fatty acids have anti-inflammatory properties. Take 1 tablespoon of wheat germ oil. Repeat this three times a day to get rid of stubborn joint pains. White willow bark is a herb that has antioxidant, anti-inflammatory, antiseptic and immunity-boosting properties. A chemical called salicin is the active component of white willow bark which has an analgesic effect just like your painkiller. Once you take salicin inside your body, it is converted into salicylic acid, the same acid which is used in painkiller drugs like aspirin. So, why not make white willow bark tea to get relief from your joint pains! How to Make White Willow Bark Tea for Joint Pain? Reducing the flame, add white willow bark powder to this water. Put off the flame and let it steep for another 20-30 minutes. Add honey to this so that you can reduce its bitterness. While eucalyptus oil is the one which reduces joint pains, jojoba oil is used as a carrier oil. But why jojoba? Because it is absorbed completely by your skin and thus you can apply this oil blend whenever you want, even when you go out. Now about the main ingredient, eucalyptus oil. This oil has natural anti-inflammatory properties that help you get rid of muscle and joint pains. It also reduces stiffness which comes with arthritis or due to wear and tear of muscles. If your joint aches due to muscle sprains, you can apply this home remedy with eucalyptus oil. Pour jojoba oil into the storage bottle. You can even use a spray bottle for ease of usage. Now add eucalyptus oil to it. Every time when you apply this oil on your joints, shake the bottle well so that both the oils get blended each time. Coconut oil has anti-inflammatory properties that can excellently reduce joint pains even those due to arthritis. This oil has beneficial fatty acids that can reduce swelling and pain and can also lubricate your muscles and joints at the same time. Applied topically, coconut oil can increase blood supply to your joints to reduce pain and inflammation. Heat the coconut oil till it gets lukewarm. Massage your joints gently with this warm coconut oil. While bromelain is the much talked about component of pineapple that contributes in relieving joint pains, there are many other constituents in pineapple that help you. Vitamin C in pineapple produces collagen which is a strong, fibrous protein needed for healthy tissues. Copper in this fruit allows proper cross-linking of collagen molecules to stabilize your tissues. Copper also nourishes your bones to support the functioning of joints. And there are several enzymes in pineapple that are collectively known as the famous bromelain. It helps in treating tendinitis which is an inflammation of tendons causing discomfort and pain in joints. So, if you want to get rid of joint pains, you may well consider adding the delicious pineapple in your daily diet. Here are some suggestions for doing so. Add its pieces in your salads, salsa or smoothies. Grill pineapples to have natural dessert. Combine it with fish fillets or any other veggies to make your meal. Not all home remedies for joint pains are as delicious as this pineapple is. Don’t you think so? Thanx for these useful home remedy tips. Thanks for these useful home remedies!